Very helpful, considerate of the fact that next door roofing project was very noisy. We stayed here over Christmas 2015. The place exceeded our expectations. 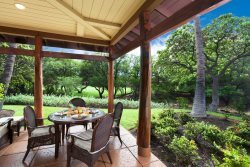 Spacious, clean, well equipped and the view off the lanai of the mountain is gorgeous. Resortica was great deal with. Pool area very well kept and nice to have the covered seating area. Loved it, would definitely stay here again. After finding this place, it was a great place to stay! Relaxing after a day at the beach and sightseeing! Lots of "extras" to use! The house was perfect to cook when we decided not to go out to dinner! We'll be back! Booking our rental was very easy, staff response time to emails was quick, and the check in/out process was effortless! Our stay at your property was truly amazing! We fell in love with the condo immediately and were sad went it was time to leave. We can't wait to come back again!!!! We were asked to have maintenance crews come work on a dryer issue that was an issue before our visit; we asked for the staff to delay this visit until after we left and they accommodate us. Thank you for the privacy! The property was extremely well maintained and the ease of check in and check out was remarkable. We booked last minute - the day before check in! - and booking and communicating was super easy and smooth! Absolutely beautiful condo in best location! Loved the decor, all was spotless, had everything you need and more, right across from pool - which we loved also! - and shopping. 5 stars!! Mahalo! We had an issue with one of the TV's. I sent an email to the staff and the issue was taken care of immediately, with no trouble for us! This place was amazing. It far exceeded our expectations and we will most certainly stay here again next year. Mahalo nui team members for making our stay cation enjoyable. We loved our first time experience...we will be back!! Emails, phone calls, were all handled professionally and in an 'Aloha' manner! We thoroughly enjoyed the comfort, privacy, and luxury of the property, grounds, and area - perfect for our honeymoon. Anne-Marie is a pleasure to talk to and extremely helpful and informative. Great location, peaceful and quiet. Loved the size of the condo. Property was as advertised. Would highly recommend this property to anyone and will be referring my friends and family when they plan their next Hawaiian vacation. Very accommodating...it was so nice to just walk in and have the place be ready for us!